Plot: Picking off from Madagascar 3: Europe’s Most Wanted, Penguins of Madagascar briefly tells the story of the origins of the penguins. Fast forward a decade, the “brothers”, as they call themselves are still as feisty and as before and now, find themselves the target of a long-lost enemy. If you remember those four incredibly cute penguins from the Madagascar franchise — and were smitten by them — you’ll know that this movie is a must-see. With their famous line from the first Madagascar movie; “Just smile and wave boys, smile and wave”, the clan proves that they are always there to save the day the unconventional way. The story starts off with how the three senior penguins — Skipper (voiced by Tom McGrath), Kowalski (Chris Miller) and Ricco (Conrad Vernon IV) — come to meet their newest member — the naïve but determined and squeaky-voiced Private (Christopher Knights). Ten years later, to celebrate Private’s birthday, the clan break into a high-security building so Private can spend his birthday money on a packet of Cheesy Dibbles out of the building’s vending machine. There, they are kidnapped by a mysterious evil-genius octopus named Dave (John Malkovich) whom they learn has a vengeance against penguins. While fleeing from Dave and his army of squids, the gang is rescued by North Wind — an elite group of animals whose task is to save helpless animals around the world — and who have been trailing Dave, attempting to nab him. When more and more penguins mysteriously disappear all over the world, the clan — led by Skipper — take it upon themselves to rescue the captured penguins and take down Dave. Naturally, the penguins steal the show with their antics and just plain cuteness. The penguins are funny and amusing, and there are several endearing scenes throughout the movie. You can’t deny the “brothers” love and loyalty for one another. In the first few Madagascar movies, the main characters were the lion, zebra, hippopotamus and the giraffe — all natives of the Central Park Zoo, and the penguins played a minor role. With the latest instalment of the Madagascar franchise focusing on the penguins, audiences and fans of the movies get a better understanding of the origins of the penguins and their progress. 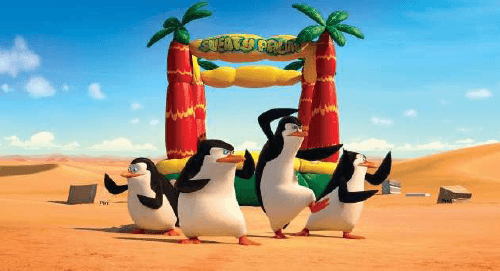 Penguins of Madagascar is a must watch movie for Madagascar movie fans, or for anyone just looking for an entertaining, laugh-out-loud family movie. Be warned though, at the end of the movie, you might walk out of the cinema with an overwhelming desire to rush out and get yourself your very own penguin.